Last week I went on holiday. It was a reasonably unusual holiday to a large Medieval house in the Peak District called Toft Hall that was once used as a setting in the British horror film “Cut”. My motivation was not to visit the venue, more to visit many friends who I don’t get to see very often as my holiday was a Bead Retreat. My job is a reasonably unusual one and there are very few passionate bead weavers and bead embroiderers in the area in which I live. This means that my “colleagues” live the world over. Despite this distance many of the colleagues have also become precious friends, even though the majority of our contact is online. The bead retreat was an opportunity for some of the beaders based in the UK to gather together for a week of hilarity, cupcakes, silliness and beading into the wee small hours. What happens at the Bead Retreat mostly stays at the Bead Retreat but I can share my main make of the week which I have called Garden Path. 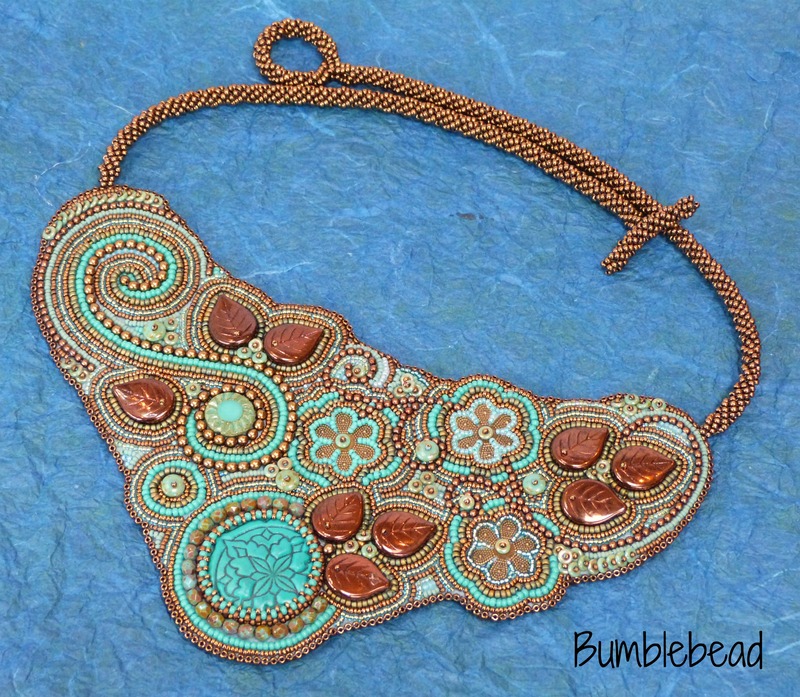 This piece was inspired by a bit of shopping sinnage after a rummage through the box of polymer clay cabochons that Polymer Artist Donna Louise Sanders brought with her to the retreat. Donna has often worked with me on projects. 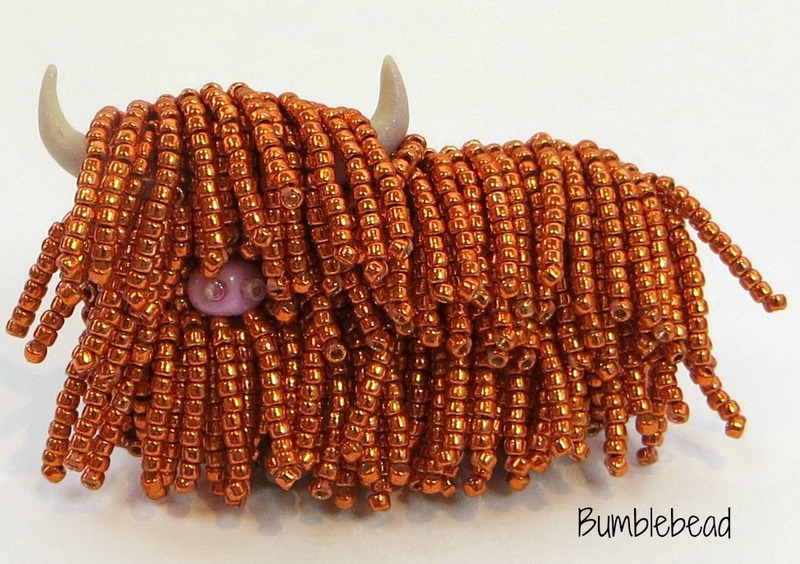 She runs an Etsy shop called Beady Notions and is the maker of the Heilan’ Coo horns I use in my coo brooches and box frames. Her talents go far beyond coo horns though as this cabochon clearly shows. Sometimes I begin these pieces with a clear idea of what I aim to represent but this time I just began with a basic bib collar shape, the cabochon and a box lid full of seed beads and interesting bits and pieces in toning colours. As we all sat around and chatted, messed around, nibbled cupcakes and so on, I let the beads wind their way and waited to see what emerged. I suppose that means this piece represents these important friendships and how our little group interconnects: the strong bonds between us despite the large distances between us. It also represents happy times, fun and relaxation.